The company making the Diamond Carbon Knockout based the design and configuration of this particular bow on some extensive research that involved asking female shooters what they are looking for in such a hunting weapon. The result is quite impressive, as the Diamond Carbon Knockout is a good looking bow that offers superior ease of use, smooth operation, and excellent accuracy. As it is sold with a plethora of extras that you will find useful, the price can also be considered decent for a bow that delivers so much. The name of the bow tells you everything you need to know about its capabilities and construction. Its carbon riser keeps its weight to a minimum, and also makes it comfortable for female users. Equipped with the binary cam technology famous for ease of tuning and extra precision, it is the kind of bow that you will have no regrets using it as your first bow or even a replacement for your old one. 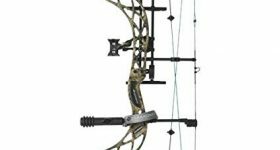 As far as performance goes, the build and construction of this compound bow will help achieve all the results you’re after. You will be more than pleased with its sturdiness, which might not be apparent, seeing how lightweight it feels, due to the carbon riser, and you will know you made a sound investment, should you decide to go for this model. There are many things to say about the design of this bow, starting with its synchronized cam system. Because it manages to eliminate the vertical nock travel, it leads to increased accuracy of your shots, even if you are just a novice. The ease of tuning is what makes it stand out, and many women comment on the fact that they love how comfortable it is to adjust the bow to their preferences. The draw length is adjustable, as expected, and tuning it happens with the help of a rotating module. The length varies between 22.5 inches and 27 inches and provides the huntress in you with the possibility to customize the weapon you want to use. The bow weighs only 3.2 pounds and measures 30 inches from one axle to another. Even among compound bows explicitly made for women, this one stands out as being lightweight and comfortable. The model is available in different draw weight configurations, 40, 50, and 60, and you also get an 80% let-off. Shooting arrows of speeds up to 302 fps, it is a redoubtable model. Its brace height reaches 6.75 inches, and that also contributes to its overall convenience. The R.A.K. package (Ready Aim Kill) includes many various accessories that you will find useful in the long run. You will get a 4-pin custom sight that will allow you to easily take your aim at your target and calculate the necessary distances without a glitch. The next accessory that you will surely want to hear about is the Octane Hostage Max arrow rest that contributes to the convenience and ease of use of the bow. Along with these extras, you will also receive an Octane DeadLock Lite quiver for holding your arrows, a wrist sling, a carbon peep sight, a 5-inch stabilizer (also from the Octane line), and a string loop. It must be said that the R.A.K. design also means that the necessary accessories are pre-installed from the factory, and they were tested for maximum performance. One thing about this bow that you will like is the 80% effective let-off, which allows you to keep the bow at full draw when the situation requires without risking to release your arrow from the bow prematurely. 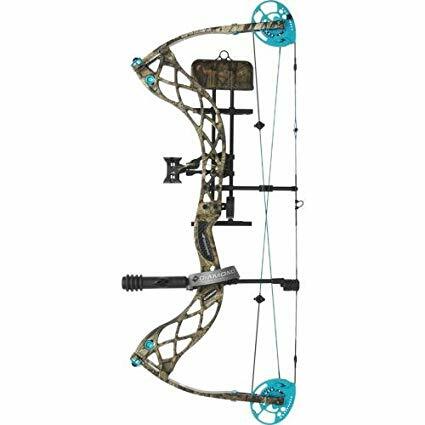 While there is no trigger release included with your purchase, you will still find this compound bow a good deal for the price. Whether you want to hunt from a tree stand or hunting blind, the performance of the Diamond Carbon Knockout will offer the highest degree of satisfaction. No mentions of noise dampening features are made in the manufacturer’s specifications, but that doesn’t necessarily mean that the bow will be noisy. As its overall construction is focused on providing smooth operability, you might be surprised with how silent the model is compared to other similar compound bows on the market. The Diamond Carbon Knockout is an excellent pick for a huntress as it is designed with female shooters’ needs in mind. From the sleek, beautiful design, to the binary cam system and the superior adjustability, you will find a product that aims at offering high performance and satisfaction at a convenient price. The model comes as an R.A.K. package, which means that its accessories are pre-installed and tested from the factory, for maximum performance, and precision. It is also a gorgeous bow, lightweight, and comfortable to use. Many women like it and the fact that the input used for the design came from discussions with female shooters only makes it a worthy buy.